You learned just about every English word you know in context, and you should be learning all new Russian words in the same way. Trying to learn new Russian words through rote memorization is absolute worst approach possible. Watch to learn the #1 way to learn Russian fast! If you are just getting started with Russian check out my free audio course. Even if you have experience, please start with Episode 1 as everything you’ll be learning is cumulative. Check it out here: –> Free Russian audio course? Heck ya! I have enjoyed you podcast on Itunes. Being that I am working quite a bit in Kiev, you podcast has made it possible for me to learn while I drive. I am now able to get around and communicate at a basic level. Thanks!! Thanks for the wonderful way on how to learn the language. I have been to many classes and nothing compares to yours. God bless always. Thank you for making the podcasts available for free! I am an ESL teacher, and I currently have a lot of Kazakh students (who all speak Russian). I am using your podcasts to gain some understanding of how Russian grammar differs from English grammar, which helps me to explain English grammar more effectively. What I hadn’t thought about before listening to the podcasts, was that I also got some insight into your teaching methods. That has also helped me improve my teaching – before I started teaching these groups, I had very little experience in teaching abolute beginners. Both being a beginner myself (in learning Russian) and seeing your methods has taught me a lot. Thanks so much. I also have a question: there are a lot of podcasts and apps out there for learning English. Do you know of any good ones that would be suitable for beginners whose first language is Russian? Thanks. I’am Tom from the Netherlands (Limburg).I want to let you no that youre way of learning Russian is really fine..I’ve enjoy’d every bit of it and while learning i’ved stayed motivated.And that is what i found very cool.It realy makes fun to learn it..thank you very much..
Spasibo, Tom! I hope to welcome you to my ‘Russian Accelerator’ course one day. Until then, keep up the great work! Thanks for the podcasts! They’re giving me a good start for before I start fulltime Russian training in a few months. Tnank you, Geoff. 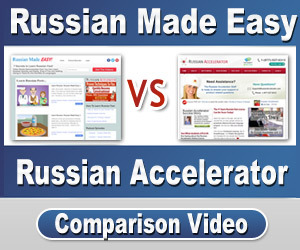 And I hope you’ll check out Russian Accelerator. It’s my online, video course. We’ll turn you into a confident, conversational Russian speaker. Best wishes for a safe, successful 2018!